As the last of STEMfest’s 4,000 participants trickled out of the Convocation Center Oct. 22, they were still buzzing with the day’s excitement. “The lasers are cool! The static electricity is cool!” one young girl chattered to her parents. Local families, university students, faculty, and staff, and loads of students from as far away as Rockford and Springfield converged on the Convocation Center for the second year of STEMfest. The annual event presented by NIU STEM Outreach help K-12 students and their parents have fun while learning more about Science, Technology, Engineering and Math (STEM). 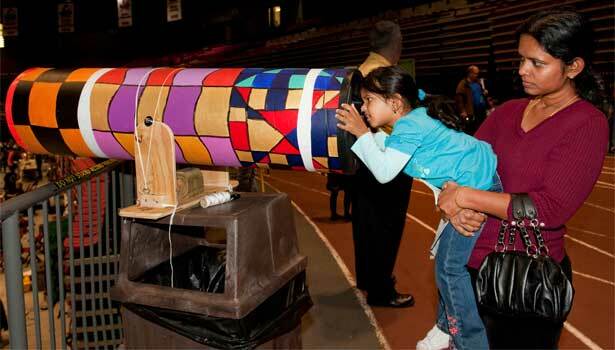 STEM Outreach’s goal was to make STEMfest 2011 bigger and better than last year’s popular event. With the help of lead sponsor Energy Systems Group (ESG) and additional university and community sponsors, organizers did just that. Kids tried on Ross Powell’s Arctic gear. Powell, an NIU Board of Trustees Professor of geology, is one of the creators of the DOER submarine, which will explore the West Antarctic Ice Sheet in 2013. Just how big was STEMfest? Response to the event has been overwhelmingly positive. When asked what their favorite exhibit was, some kids couldn’t decide because there were so many things to choose from. Others raved about the robot exhibition from FIRST Robotics in which eight robots build by high school teams competed to complete complicated tasks. 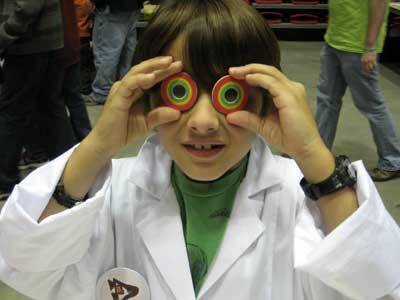 Ninety-five percent of children surveyed said they can’t wait to come to STEMfest 2012. Parents had a blast, too. “All of the effort it takes to put on the fest is worth it when I walk around and see so many excited children and parents learning and having fun,” said NIU’s STEM Outreach coordinator Pati Sievert. Sievert said she hopes that STEMfest will have a lasting effect on the community. Girl Scouts earned Passport to My Future badges. 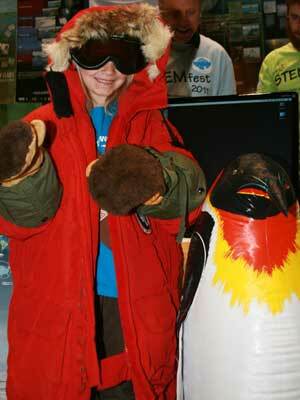 STEMfest also seeks to make an impression on students themselves by educating kids about career opportunities in STEM. The majority of students who completed surveys after the fest said that they were now considering STEM careers. One kindergartener surveyed before and after the fest is now excited about becoming a biologist. Before, she was most interested in a career as a mermaid. That future biologist was also one of more than 230 Girl Scouts who earned Passport to My Future patches for exploring the fest and interviewing female STEM experts.The Passport to My Future is one of NIU STEM Outreach’s programs to encourage girls to pursue careers in STEM fields. In addition to the Passport patch, this year’s fest offered an opportunity for Boy Scouts and other youth groups to earn patches as well, an activity requested by attendees in 2010. 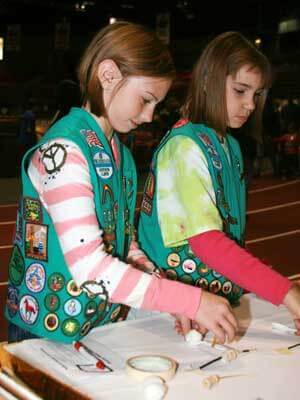 Exhibitors who were new to STEMfest are also lining up for next year’s event. Fermilab exhibitors joined many others in praising the organization and success of the event and said they never had a slow moment during the day. Pictures from the fest and complete lists of contest winners, exhibitors and sponsors are all available online. And the fun doesn’t stop after STEMfest. NIU STEM Outreach offers educational community programs year-round, such as school science assemblies, the SF Teen Read, Summer Under the Stars and professional development workshops for teachers. Visit http://www.niu.edu/stem to learn about upcoming events and sign up for the STEM Outreach newsletter.